Sounds so much like my story. Email me and I will see if I can help you. Jconwell@live.com. Couple of things. Call the Exogen people directly. My insurance would not cover it and they let me get one for under 300 bucks. I was in a wheelchair this time last year. A combination of Doctor Blake’s advice and finally finding a great PT after going through 4 of them is what saved me. The orthopedic doctors were not helpful to me personally until I found one that worked closely with the PT. HiJohn...I am from India. Been through this injury ...wheel chair and all. Got out of it with Dr.Blake's advice and help through this blog.Is it okay if I email you-to learn some more on dealing with this? Btw I did not have surgery. The surgeon who knew the most about it said that would not be the thing to do in my particular case. I had stress fractures and AVN. Could you please verify the position of bone stim for sesamoid fractures? 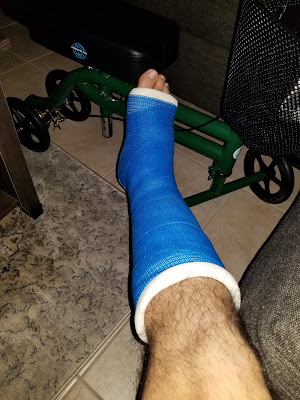 I know, every case is different, and in this case (cast?) you say it should lay on the top of the big toe. I use the opposite side, just below my fibular sesamoid. It is less convenient, but I assumed it was better to get closer to the injury(pain). Thank you!